So, you’ve designed a fantastic new product, but it doesn’t look very pretty and it’s also at the mercy of the elements until it’s been enclosed in some way. That’s the problem with electronic components; they may be highly innovative, even beautiful in the eye of the engineer, but they do need to be protected. There are a number of solutions to protect electronic components. You could use potting, essentially boxing the component and infilling with resin. Or you could opt for traditional injection moulding that provides a very effective cover, but is a complex and costly exercise. The alternative is low pressure overmoulding, which sits somewhere in between potting and injection moulding. This process is not only quick and cost effective; it also provides the opportunity to make products more bespoke and attractive to the consumer. Not only that, but in many cases potting is not viable, and therefore electronic manufacturers are faced with the costs and timeframes of injection moulding. This is why low pressure overmoulding is such a great solution for so many electronics firms. So, what are the key advantages? Being able to bring electronic products to market at the right price point is essential, so if there are ways to trim back manufacturing costs you’ll want to know about them. Low Pressure Overmoulding (LPO) is cheaper than other solutions as no secondary parts are needed, and the process is highly efficient. The super-efficient process means that assembly is very quick. Unlike potting there are no long curing times, in fact the enclosed product can be further processed or shipped within minutes of being processed. Cycle times are low too, taking just 15 to 90 seconds depending on the components being assembled. Due to the low-pressures involved in LPM this process is ideal for overmoulding PCB’s with very small SMD components down to 0402. With pressures somewhere between 5 and 8 bar, sensitive components are less likely to be damaged when compared to high pressure injection moulding processes. 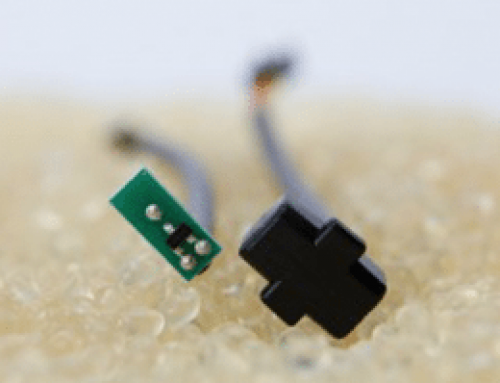 As electronic components are completely enclosed by the Polyimide adhesive, they become watertight and protected from other environmental factors – humidity, heat, cold, dust, sand etc. At EC Electronics we have worked with Salamander Pumps on a solution for protecting their Hall Effect Sensors; used to switch a shower pump on or off in certain conditions. Naturally this has to be guaranteed watertight to work effectively and potted solutions had proved too costly and unreliable. The LPO solution has enabled Salamander to reduce production costs of these sensors by 40%, and create a 100% watertight product. As well as protecting your electronics from environmental factors, over moulding also protects them from the prying eyes of competitors. The technology used creates a shield that is almost unbreakable, making it very difficult for competitors to get sight on your IP. Finally the over moulding process also offers opportunities to brand products and create unique designs. Using 3D CAD Mould Tool Design there are no restrictions on how the product looks once enclosed, and it offers ample scope to imprint logos and create bespoke products.